This link appears to be dead, and to redirect to https://www.helsinki.fi/fi/laaketieteellinen-tiedekunta/kansanterveystieteen-osasto, which is the Finnish version of https://www.helsinki.fi/en/faculty-of-medicine/department-of-public-health ; the site has no information on Matti Siivola. http://www.helsinki.fi/~msiivola/ — Matti’s old home page, linking to the above dead link as a new home page as of 1998-05-04! http://www.helsinki.fi/~msiivola/go.html — Matti’s old Go page, last updated 2009-01-07, when he had been president of the Finnish Go Association? and was chairman of the rules and ratings commission of the European Go federation. Has links for five rules beasts, mostly to textual representations. https://www.cs.cmu.edu/~wjh/go/rules/siivola.html — Four of Matti’s five rules beasts as better-looking diagrams. 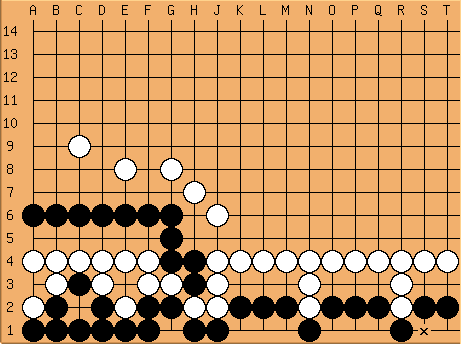 A tesuji filling your own eye by Ing rules.